Despite the joint authorship, this is Adams's (The Long Dark Tea-Time of the Soul, etc.) book, written in the first-person and marked by his singular nose for absurdities, as he and zoologist Cawardine--who contributes an epilogue--tour the world on the track of rare or endangered species. 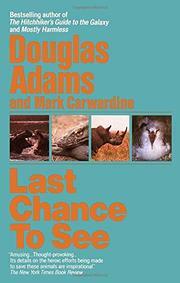 The journey begins in 1985, as the two men tramp through Madagascar in search of the aye-aye, a rare nocturnal lemur ("like virtually everything that lives on Madagascar, it does not exist anywhere else on earth"). Three years later, still flush from their first success, the team reunites to hunt the Komodo dragon. This proves a sickening enterprise, involving passage through honky-tonk Bali ("Bali Theme Park," Adams dubs it) to a bedraggled island where the giant lizards gulp carrion before delighted polyestered Americans. On to Zaire, where a tangle of red-tape and greed ("every official you encounter will make life as unpleasant as he possibly can until you pay him to stop it") doesn't prevent a glimpse of white rhino and mountain gorilla. In New Zealand, the duo spots the kakapo (a fat, flightless parrot); in China, the Yangtze River dolphin; in Mauritius, a rare fruit bat--all allowing for hilarious travel writing (as in Peking, where Adams visits Mao's tomb while the theme from Hawaii Five-O blares over giant loudspeakers) as well as a noble plea for ecological sanity. Surprisingly mature reflections on the environment--with Adams's trademark comedy humming along at high pitch: eco-humor comes of age.